Fifty is a circular woodblock coin print depicting the obverse side of a coin, featuring the artist’s profile. The background is filled with circles and intersecting cuts, and the round outer edge of the print features radial lines that mimic the reeded edge of a coin. 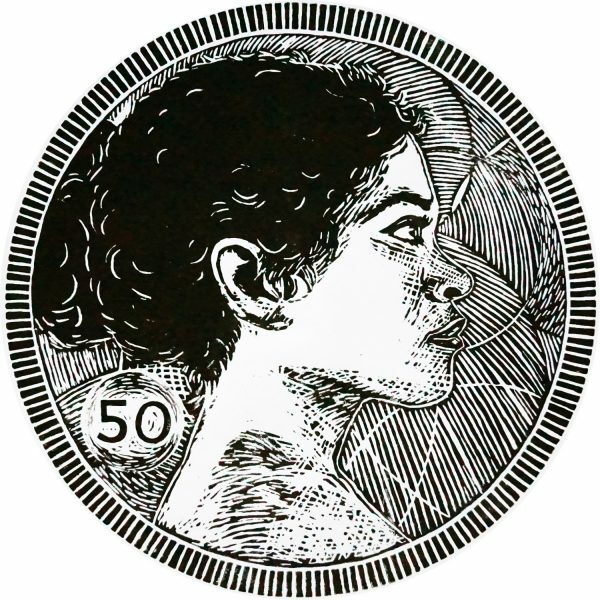 The print serves as a self-portrait and expression of authority, with the artist issuing currency in her own image. 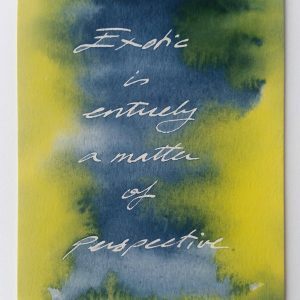 This print is in an edition of 12, and this listing offers no. 3/12. As this is a run of original woodcuts, each print will be slightly different and imperfect, as is the nature of woodcuts. 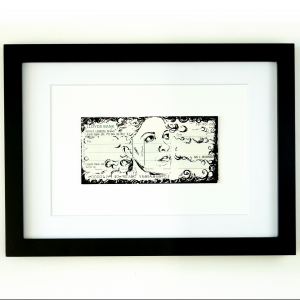 This print is a part of the Foreign Exchange series – a group of artworks about money, value and trust. 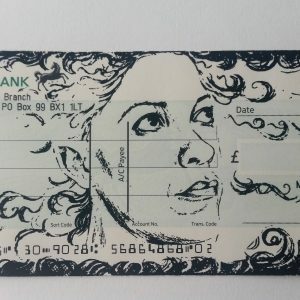 This piece combines the material of banknotes with the form of coinage – but with the added fact that this print is only single-sided, so does not fit the traditional function of either form of money. This puts it into the category of art object whilst it tries to be currency, twisting exonumia (the study of tokens) with notaphily (the study of banknotes and paper money) and . Woodblock relief print on paper, using waterbased ink. See this blog post for more on how the print was made. The phrase “woodblock coin print” carries connotations of having created a separate work of intrinsic value in the form of the block from which the print was taken, as if the real coin – the real artwork – is the block itself, and the prints just the symbol. This is what makes this kind of relief printing so interesting for artwork about money. This item will be delivered mounted but unframed unless otherwise requested. See framing options in a separate listing. This work relates closely to the Promise prints, 250 coin, as well as to the One Hundred print series.